Exciting news at And She Made headquarters today. 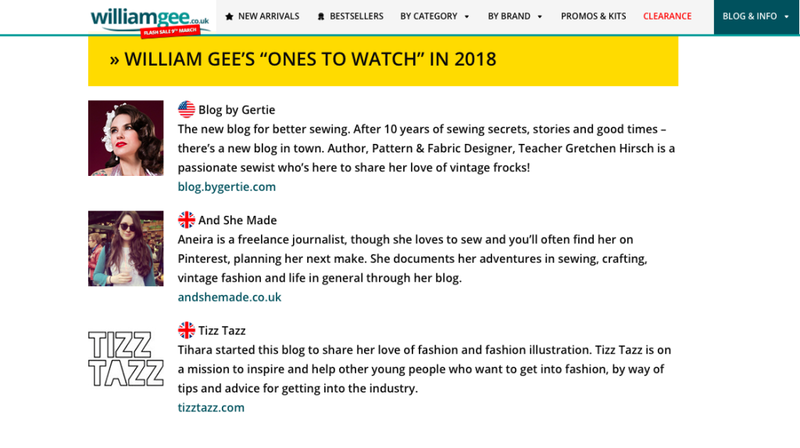 We’ve been named as one of the ‘ones to watch 2018′ in William Gee’s guide to the best sewing blogs to follow in 2018. Featuring other sewing bloggers and Youtubers such as By Hand London and Sewn, we’re in great company. And not only that, but we’ve also made the cut as one of the top 60 sewing blogs on Feedspot, coming in at number 49. Not too bad, eh? I really appreciate those of you who read my blog, even if it sometimes feels as though it’s just my Mum reading. It’s a bit of a labour of love and I just love having a place where I can look back and see what I’ve made over the years.